For some time now this topic has been on my mind, I was going to Instagram about it, but it never felt right, I have started to write about it a couple times but it never gets posted, but tonight I am sitting in my room in my "writing chair" and I am going to write this out. I know a lot of women who struggle with it because I get emails from people about my marriage blog and they ask me to write about fear in marriage etc, so I know as women it is a topic that we cannot take lightly, a topic that is hard to write about because as much as you would like to think that my little life is perfect ( I am told this in emails), my life is not perfect because I live with a lot of fear. I live in fear of road trips, I love going places, last summer we had a 3 1/2 week across USA road trip and I had so much peace while I was gone, I slept a lot in the car but this past weekend we had a road trip 2 hours away for a wedding, going there it was pretty good because it was not yet dark, coming home it was dark and I was crippled with a fear, it got to the point of making me nauseated, thankfully my husband can pick up on this and he will talk to me about anything at all, anything to take my mind of my fear. I live in fear of losing Andrew or Brooke- I do not ever want to live without them, I do not know how some people does it, when hey lose a spouse or a child. I live in fear at work- you can laugh at this if you like because it does sound silly but when my managers phone rings at work I always think it is a call about me, something I did wrong, someone calling to complain about me.. this is true, it is hard to deal with. 1) Pray- Jesus is the peace maker he can calm your fearful mind and heart, even if you do not know what to pray just talk to him as you would a friend. 3) Find someone to talk to- I talk to my husband and sometimes the topics are so random that it probably makes him feel crazy but it helps me so he is a good man. 4) Write- write out your fears, and then write why you have that fear- if you try to find a reason why you are fearful like e.g. : road trips if you think you are in fear driving in the car because you are scared of a car accident, think about why you are scared of car accidents, have you ever been involved in one? 5) Try to find a reason why you should not have this fear- have you ever lost a job because you did something wrong, have you ever had a car accident etc etc? 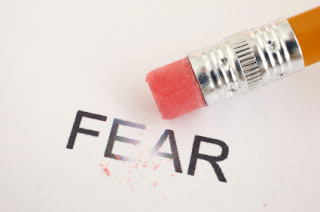 Fear is hard, I know that, I struggle with it daily, I try so hard to work on it because fear is not healthy, it can cause depression and anxiety, so please do not struggle alone with your fears. Prayer and scriptures are the best first answers for more and more things in my life. I also find that I need to control my thinking. 2 Cor 10:5 - taking those thoughts captive. I try to stop the fearful, angry, sinful, etc. thoughts complete themselves in my head. Easier said than done, but I find that if I let the thought sit in my head, it build inroads, nice little paths of lies sit in my head. Keep fighting the fears! God wins, but we have to rest in Him to share His victory. Glad to be joining you on His path. Thank you so much for being vulnerable and sharing your struggle with us. I have struggled with anxiety for as long as I can remember. There is nothing more powerful than prayer and God's Word! But I have found it very beneficial to speak with a Christian counselor, too. We are getting ready to move 2 hours away, and I'm already looking up counselors in the area! I know I will need someone to speak rationally to me in the midst of my crazy! Thanks, again, for sharing with us!